The most obvious reason for undertaking a technology commercialization risk assessment is to provide information necessary for an objective investment decision. The nature of competent technology commercialization assessment is to generate a wealth of information to mitigate identified risks. Firms in the ‘business’ of technology and product commercialization require a strategy not of risk avoidance, but of early risk diagnosis and management. Such a process allows firms to diagnose thoroughly and systematically the technological, organizational and business risks a project faces, and to formulate and implement suitable risk management strategies. The true nature of project risk is determined not only by its likelihood and its effects, but also by a firm's ability to influence risk factors. 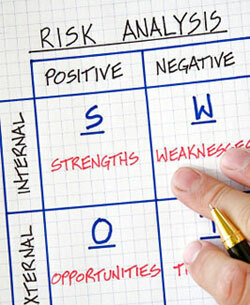 Once the risk factors are objectively assessed, the next step would be to systematically reduce or eliminate them. Understanding the sources of risk early in the product definition process helps to reduce the challenges in development downstream. Keycare’s Risk Assessment and Mitigation (RAM) process analyzes and assesses the likelihood of project risks, and then identifies ways to mitigate these risks identified. 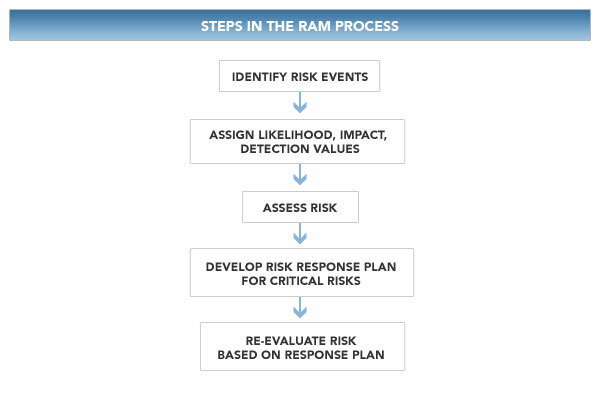 The benefits of RAM include having an objective, criteria-based process that focuses on the most imminent risks, prioritizes risk contingency planning, improves team participation in the risk management process, and develops of improved risk controls. The technique used by Keycare’s RAM model identifies the likelihood of the risk occurring, the expected impact of the risk, and the capability to detect a risk event that might occur (as early as possible), and the risk detection methods used to do so. For an example of RAM Process, view the "Related Documents" at the top of the page, and download Keycare RAM Sample.